Last time I promised to explain exactly why "blocks" comprise just one movement and not two. But before I do that, I must first set out what is meant by "one movement" and "two movements" in this context. First, I want to make it clear that I'm not talking about two different arms moving (which I covered in my article "Two for the price of one: more about karate blocks"). Rather, I'm talking about two movements off one arm, intended to deflect or otherwise stop an incoming attack. I recall as a young martial arts teacher being confronted with this issue when a rank beginner asked me: "What stops me from just hitting you as your arm goes to the side?" a swing back to "smash the attack out of the way". Indeed, the same is often said for downward blocks: there appears to be a swing up to the ear, and only then a downward swing to "smash the attack (eg. a kick) out of the way". I must confess that I was left gobsmacked by this question. It was right at the end of the lesson. I had never even considered this "analysis" before so it was hard for me to find a response. It simply wasn't on my radar. I knew that what he said was fundamentally wrong but I couldn't, for the life of me, say why at that moment in time. The beginner left with a smirk, probably destined never to revisit a traditional martial arts school again. The answer: no block requires you to "swing away first"! Of course, the answer came to me when I got home (by which time it was far too late): the analysis was hopelessly misconceived precisely because it bore no actual resemblance to what I'd been showing the beginner. In other words, it was nothing more than a particularly weak "straw man". No block - I repeat no block - requires you to "swing away" first, then swing back to "block" or "smash". less commonly, to jam it at its source (strikes tend to be used more for this purpose than traditional "blocks"). This is what is meant by "uke" (ie. what we call "block" but which comes from the Japanese verb "ukeru" meaning "to receive" - a rather more apt term I should think!). In other words, there simply is no "technique" of the kind described by that beginner. "Blocks" don't involve swinging away from the attack, nor do they envisage some sort of "sideways smash" (like a car reversing first, then accelerating out of a side street so as to "T-bone" yours). Such an approach would be manifestly absurd. No martial art has ever featured such tactics, so pulling them apart hardly evidences the shortcomings of traditional "blocks". Consider the above gif and you'll see what I mean about the chudan uke (the very same one I was showing the beginner that night 28 years ago). You'll see immediately that my chudan uke moves out towards the punch so as to intercept it and deflect it sideways. To do so, it has to reach the punch at an angle. But this doesn't mean it has to "swing sideways". The line to the attacker's forearm is straight. It is the shortest distance between two points. So what is it that makes people think that there is a "sideways movement" to blocks like chudan uke? Probably the fact that the outward movement of your forearm is angled as you effect your interception. "Aha - isn't this a 'sideways' movement?" No. It isn't. It is just the necessary angle of attack - the angle that allows you to redirect the punch optimally (ie. with the greatest efficiency) rather than meet force with force (ie. "head on"). After all, you don't exactly want to end up fist to fist. That might be an even "straighter" line to your attacker, but it is scarcely productive of a good outcome (at least, for the average person). The inevitable response is this: "But I don't do my blocks like that. For example, I have a very different chudan uke. We do swing to the side first!" Oh dear - there goes my whole thesis that blocks work! I suppose I'd better pack up now and call it a day! Who says any swing to the side / up to the ear, etc. is part of your "block"? It isn't. It is nothing more than a repositioning of your arms in basics practice in order to permit consecutive repetition of blocks. It is a convention adopted during formal exercises in class - not a literal application of the block. But what if your range and/or positioning are simply inappropriate for the block? Well, you don't get to use it in that circumstance!2 It's that simple. So why practise the "basic version" of a block? For this simple reason: it is a platform that enables beginners to exercise the full range of the technique in a repetitive format. It's true that you can practise punches solely as "three inch jabs" from your guard (ie. using very little range). On the other hand you can also throw a full power punch (using a full range). While there is some scope for "short techniques" for developing specific skills, which one do you think is going to be more imporant to a beginner? And which one are you going to use (most of the time, anyway) against a bag/shield/makiwara? Answer: the full-range punch. Why? Because it permits you to throw full-force punches. To some extent it also covers the shorter ranges (eg. the short inverted punch to the ribs as well as a jab with the last few inches of your punch). In other words, it is a more complete movement. Sure, you can exercise the smaller movement from time to time. But, particularly when you are learning as a beginner, the more complete movement gives you a much better idea of what it is that you should be doing - if for no other reason than the technique is "amplified" when it uses its full range: small angles, subtle planes of movement and other significant, if tiny, details can be more easily noted, understood and assimilated. If you're going to exercise a full range of motion with a technique, you need to be aware of the different "starting positions" to permit that full range of motion. In the case of a basic chudan uke of the kind I demonstrate in the gif at the start of this article, this typically involves moving from the chamber at your hip (in much the same way that a basic punch exercises a full motion by proceeding from such a chambered position). In the case of what I call the "shorin" version of chudan uke, the full range is exercised by moving from an extended arm starting position - which in basics terms means that you will probably be extending it out from the hip before you can execute the block. This "shorin chudan uke" uses a rotation of the forearm to deflect attacks. It is for this reason that the forearm must be extended - either across your body or directly in front of you. As I discuss in the above video, the "shorin chudan uke" is particularly useful after you've punched. In the adjacent series of pictures I depict a rather more "stylised" postion after a punch, but my video shows more realistic variations. Jeff and I demonstrate a drill which uses consecutive "forearm rotation" chudan uke of the "shorin" kind. Note: there is nary a "sideswing" in sight, even in what is a patently artificial drill. You'll note that with your arm extended, you don't have the luxury of throwing your arm out to meet the attack - because it is already "out"! Instead you must rely on the rotation of the forearm to redirect an oncoming attack, either to the side (as per naihanchi, for example) or side and back (as per sanchin kata after the punch4 - see the adjacent gif) or side and forward (as per many wing chun blocks). Yes, when practising this as a basic, you might position your arms in a kind of "chamber" necessary to explore a full range of motion in repetitive practice. But you certainly aren't "swinging" the arm anywhere so as to "smash things aside". As with the "shorin chudan uke", the "reset" movement (in this case the movement from your hip chamber to your ear) is not part of the block. It is just a basic practice convention, permitting you to keep repeating basic, full-range, downward blocks one after the other. Yes, you can interpret this "reset" movement as something - especially in the context of a kata where it exists dynamically (rather than as an isolated basic). Accordingly I think it is simply incorrect to say that some practitioners have a "different way of blocking" - one that actually uses two movements. They don't. To be remotely credible techniques, blocks must all follow the same basic principles, one of which is that they must go directly to the attack to intercept it so that it can be either deflected or jammed. Blocks simply cannot take a circuitous route to their destination. Yes, it's true that we traditional martial artists often exercise basic movements that require us to "reset" our arms between repetitions. But this is so as to enable us to practise full-range techniques consecutively. This reset essentially involves moving from the finishing position to an ideal, full-range "start position" or "block-specific chamber". The reset is usually not part of the block itself. Rather is inevitably just an artifact of basics practice. I've had quite a few comments already on this issue (largely in response to my previous article). A common theme to these comments has been the sentiment: "I believe that blocks are both blocks and other things". To a large extent I agree. But I am also sensing a latent fear among some of these commentators that if they accept a "blocking" explanation it might somehow necessitate abandoning other applications. Nothing could be further from the truth. Many "strike applications" for blocks are not only plausible, but arguably preferable. This is the case with many "low blocks" - especially those that finish with a "tetsui" (hammer fist), eg. in gekisai kata. I think that in such cases we have a strong indication the the designer intended a strike - as an equal or perhaps even primary application. There is nothing wrong with this. We need to use our kata for inspiration, as well as understanding the more general principles of the movement (which can translate to multiple scenarios). "Sometimes a block is just a block." A classic example is attempting to use the chudan uke (whichever version you like!) as a kind of "uraken" (backfist) - which it can never be! I propose to examine such a case another time. In the end, if you are of the "there are no blocks" conviction I hope this article leaves you with some greater awareness of the issues. Presumably you've reached your conviction on the back of the assumption that "blocks require two movements". As you can see, this assumption is manifestly false. And if you have labored under it, I think it is fair to say that you still have a lot to learn about "blocks". How can you say otherwise? After all, you've built an entire art avoiding these marvellous tools all because of a false assumption! If this is the case, isn't it time you had another look at the "humble block"? I assure you that there is much more to this art and science than shield-like guards and palm slaps! I suspect that many people who employ "power adding" measures to their blocks (eg. the "double hip") have an insufficient understanding of "blocks". In particular, they don't seem to understand that they work best as "soft" redirections. This is true from the perspectives of efficiency, effectiveness and simple availability. In terms of the latter, you hardly ever have a full range of motion at your disposal to effect a "hard" block using a "wind up" swing. In this context it should come as no suprise that many "power adding" advocates are also at the "cutting edge" of "there are no blocks" revisionism. After all, if you interpeted each "block" as requiring two movements (the first being a kind of "momentum wind up", the second being a technique that relied entirely upon that wind up) you'd quickly realise that these techniques were hardly ever available for defence. So they'd have to be attacks - right? 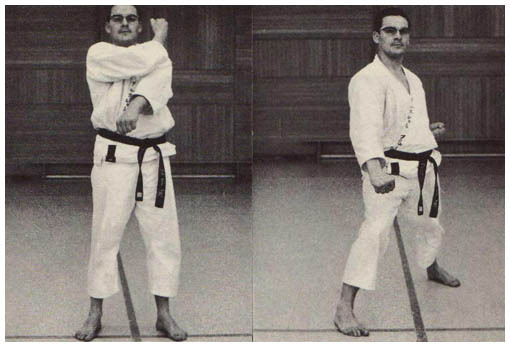 The forearm rotation block in sanchin kata is one I call "mae ude hineri uke". I hope to cover it in detail in a future article. When we spend a long time thinking one way, it can be very challenging indeed to change our minds. The name for this tendency is "cognitive dissonance". My suddenly look so amateurish. I have gone through many stages in the trends you describe. I started with all blocks are literal blocks (as in the full chamber etc), I then thought that they were blocks but only a small movement of the whole basic technique (wich I still use as a basic application coupled with body evasion). Then my teacher opened up my eyes to the striking applications, Iain Abernethy showed me through his books how they could be joint locks, throws and just about anything. I really enjoy your work, and I am sure there will be a lot of comments soon lamenting you for trying to show us that sometimes a block can be a block, and why we do not see them in MMA etc etc. I believe that if we look at the whole movement many "sophisticated" application of them can be derived or latched on as a mnemonic in forms training but we should not forget that we also need defensive techniques. Action beats reaction yes, but that does not need that we only need offense without defense. We might not fall down and grapple in a street fight (my experience contradict the 99% goes to the ground myth) but that does not mean that we do not need some sort of ground skill (to become standing as fast as possible in a self defense setting) training at all. Once again thank you for reminding us "applications finders" that we should not loose sight of the simple things. Really enjoying the essays. Regarding uke, the methods you outlined here are exactly how we train them too. Perhaps the exaggerated movements or "preparations" for uke also came from instructors who began to teach karate for the first time in mass groups. Maybe they made their movements bigger so the people at the back could see! Another idea - swings and exaggerated movements serve as a reminder about tai sabaki - twisting and rotating the body as well as opening and closing the chest/back. My background is in wado ryu which has high efficient and rather minimalistic-looking techniques with a focus on tai sabaki. @Ørjan - thanks, but don't let my verbosity impede you from writing on the subject as well! The more voices heard on this subject, the more we can turn the revisionist tide! We all like being "application finders" - the problem with some is that they start believing that the picture in the piece of toast really is the Virgin Mary! @Stephen - thanks mate! I think you're spot-on with the basics for mass groups. Karate kihon done en masse really only became popular when it started being taught to school kids and then in Japan. Before that, I doubt people had "kihon" versions of all techniques, performed in endless repetitions while standing in lines. I don't want to say that this practice isn't useful (it is) but this method of teaching runs the risk of having the purpose of the basic technique being misinterpreted - particularly when you have a "don't ask questions" culture! I like the way you're thinking about tai sabaki. I suspect extra movement is a "remnant" - like an afterglow image of what used to be there. Or, put another way, like the trembling of my dog when he wants to run but I've told him to sit and stay! I actually remember reading somewhere that before the 1900s there was no "kihon" and the techniques did not have names like they do today. There was only "Kata", conditioning (strength, endurance etc), impact work and pratner drills. The Kihon came after or at the time Karate were introduced in school to isolate certain Kata movements to drill them in isolation. Kenwa Mabuni wrote in the 1930s I think that he was responsible for the naming of many of the techniques in Kihon because before he did it they had no names.. The impact work they did was wery different than many think today if you look at Itomans book "Study of China Hand". He shows the standard Makkiwara punching techniques, but also says we have to practise punching while standing, sinking, falling, out of balance, moving, standing still etc etc. He also shows blocks and writes on at least one occasion that you can either pull your other hand to the hip (as in Kihon) or leave it in front of you ready to attack or defend. Yes, I believe that is correct Ørjan. Mabuni did a great job of systemising kihon - to the extent that in our college we still use his myriad terms and standard practice methods. I have a video somewhere of my instructor going through every basic technique and its name in "line practice". I think this has some value, however it is not what the old Okinawan karateka did by any stretch. It was more like the Chinese arts: there is form and there is application: there is no "standing in lines" for anything other than some punching in horse stance (which seems to be common to many Chinese/Okinawan/Japanese/Korean arts). I think this basic template was simply extended by Mabuni and others. You know that I still admit looking for more applications of uke waza using the full range of the movements within the context of kata (now I see we do have an agreement here, after all), but regardless of that, what you explained here is objective, logic and realistic. As usual! "the more complete movement gives you a much better idea of what it is that you should be doing - [...] details can be more easily noted, understood and assimilated." With those large formal representations of movements there would be less risk of confusion as regarding to side, direction, etc., when transferring knowledge from one person to another. The need for exaggerated movements becomes even clearer when we think of mass teaching, as Stephan and you were discussing. But what happens is that today many practitioners think of the formal representations as literal movements. "in application against a resistant opponent, you block from wherever your hands happen to be." In my opinion, the various different forms of blocks are specially related to what you stated and is quoted above. I believe the various forms of karate blocks basically bring together the optimal ways of responding to attacks. Btw, some time ago I was learning tensho kata, and all those hand movements felt so crazy to me... until I sparred" with my wife and she came with a flurry of punches, that I had to defend however I could... and then tensho seemed to absolutely make sense to me! -- After all, we have to defend from the position we're already in, and just try to use the best body mechanics possible from that. But do you think I'm really on the right way with relating this to moves from tensho kata? "Btw, some time ago I was learning tensho kata, and all those hand movements felt so crazy to me... until I sparred" with my wife and she came with a flurry of punches, that I had to defend however I could... and then tensho seemed to absolutely make sense to me!" Excellent points my friend. Thanks for your contribution! And yes - I think you are on the right path there! Thank you for your response, Dan-sensei!